Day 2 Started with hardy breakfast of wonderful South African beef sausages and eggs, with some strong coffee to keep me awake. The staff at the Road Lodge Cape Town Airport were wonderful, making sure that we were all taken care of, everyone was very professional with a very high degree of service, a nice way to start the day! We loaded up the support truck and it was evident that everyone was super excited to get on the road, even though there were rain clouds all around us. 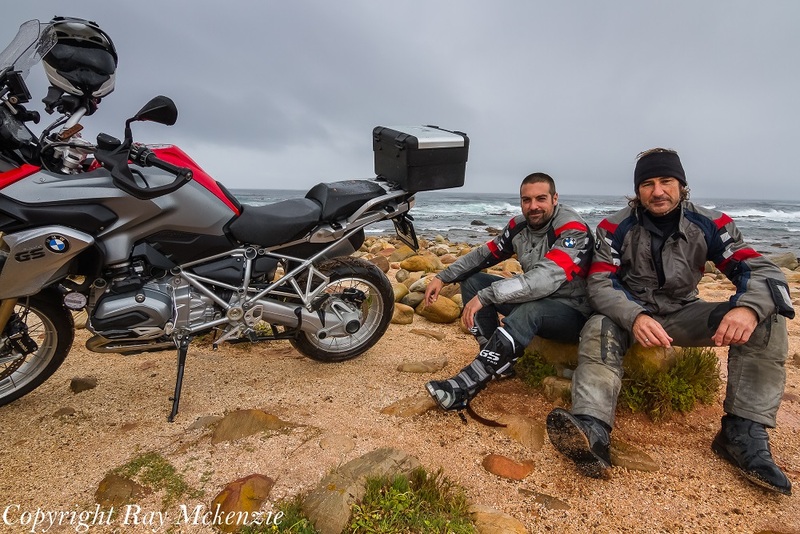 Today we would be talking the long way to the Cape of Good Hope, the southernmost point of the African Continent and that excitement was palpable, which meant everyone got their gear on fast and were ready for the road in short order! 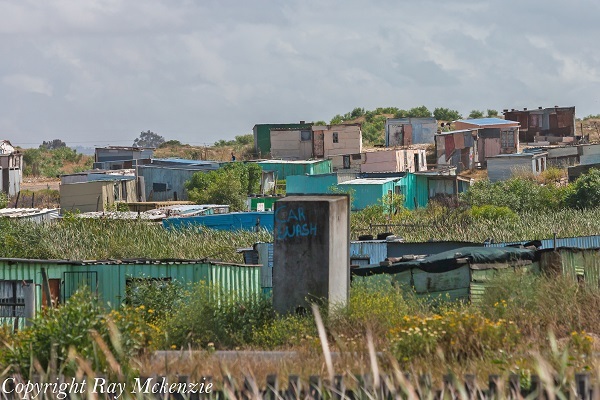 The area around the airport had many shanty towns so everybody was doing the “bobble head” as they rode along the highway checking out the expanses of tarpaper, and tin roofed houses, which in some cases covered very large areas. What was also apparent was just how many people wait along the roadside, and highways for rides, people were everywhere, and they presented an issue for any road traveller as they showed no fear while being inches from vehicles travelling 60 miles an hour! Note to self, watch for people in the road, anywhere, all the time! We eventually made our way to Muizenberg Beach, where we stopped briefly to watch the local surfers catching some waves! Even though the day was relatively calm at that point, the waves were still fairly big giving the surfers lots of entertainment, and us a sight we would not normally see, especially in Canada! The mountain tops surrounding the Cape Town area were all still covered with a thick blanket of cloud which would give us some rain now and then as a reminder that it was still spring in South Africa! 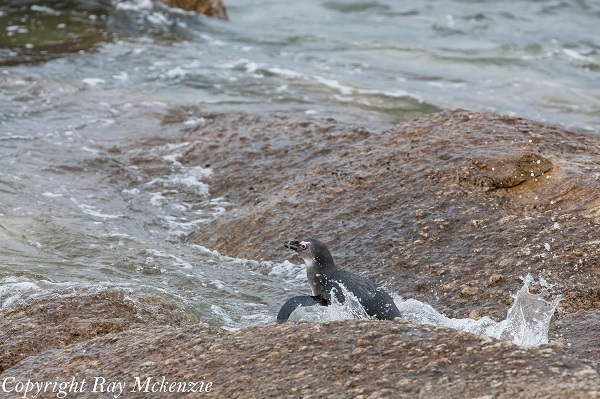 We continued into the south end of Simon’s Town where we stopped at a park with an ocean view of Ark Rock, and there was supposed to be penguins there for us to see up close! We walked the area, and despite Bob’s excitement we on saw one penguin, and he was quite a distance away from us. I entered into stealth mode and engaged my special photographers cloaking device, getting within about 60 feet of the penguin before he spotted me! I started taking pictures and he took off like a shot out of a canon, heading into the water with a splash and was gone from view. I did managed to get some shots of him, but nothing stellar, he was a cagey penguin and the only one we would see on the entire trip. 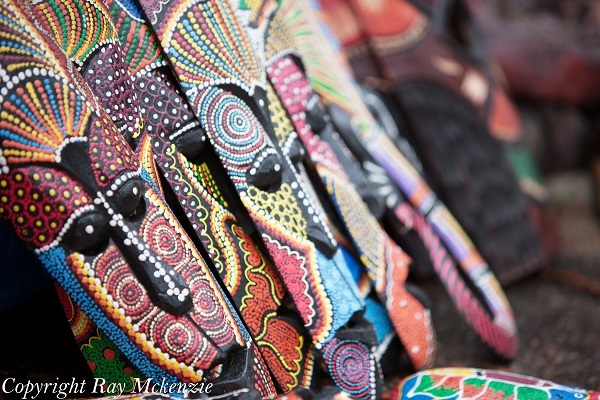 After the penguin debacle I was happy to look at some true handmade African masks and idols. 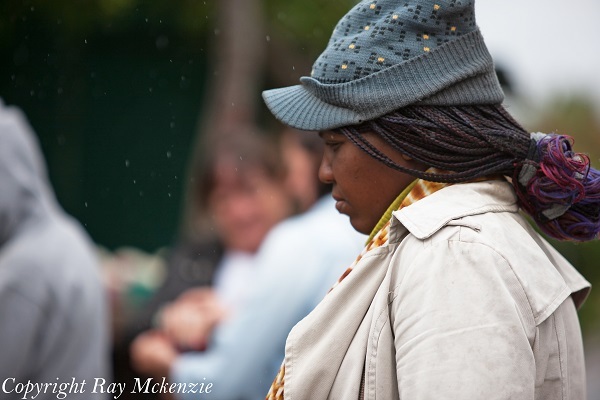 Although I did not buy any, I did give the lady a donation because I was taking photographs of her and her display, she was very kind and friendly, what a wonderful woman! We then made our way up to Cape of Good Hope Nature Preserve through clouds literally a couple of hundred feet above our head! The drive was stunning none the less, ending at the Cape Point Lower Funicular a trolley that goes up a very steep incline to the Cape Point Lighthouse. 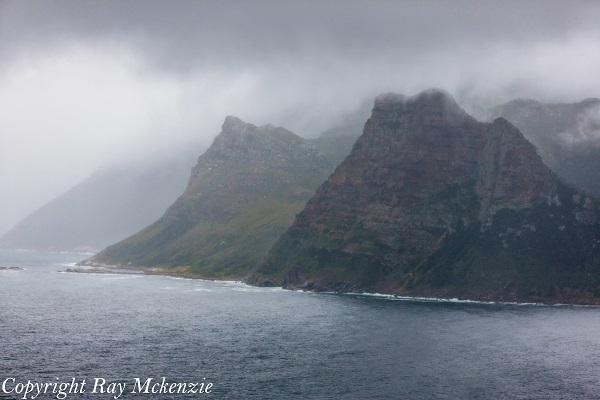 Despite the rain and low cloud ceiling the area was incredible for its rugged beauty and sheer cliffs. A troop of baboons entertained us with their rock climbing display on some of the cliffs above us! We walked all the way up to the lighthouse stopping to take photographs of the rock formations and the ocean. At the top we walked around the lighthouse which provided a stunning view of Cape Point, the southernmost tip of continental Africa, I was so exctied to be experiencing such an incredible scene! The winds were strong enough to get our attention, with the waves crashing on the rocks below a stark reminder of the real purpose for the lighthouse! 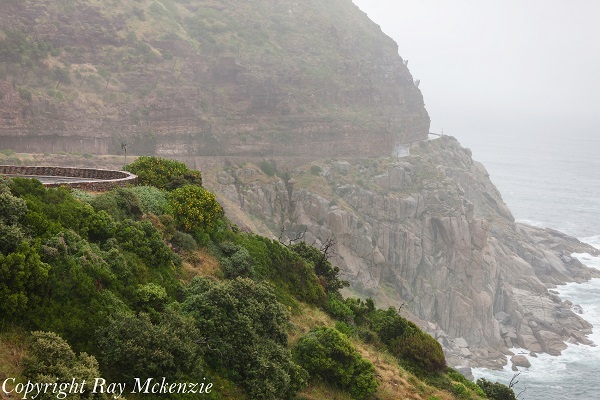 Once the rain started the wind seemed like it was blowing the rain horizontally, so it was not long before we retreated to the funicular and then down to the Cape Point Restaurant. The restaurant is perched on the edge of a cliff so you can enjoy a panoramic view of the seascape below! Definitely worth stopping for a meal if you visit Cape Point! We ordered our food and shortly thereafter Anthony Carrino (HGTV Cousins Undercover) showed up! 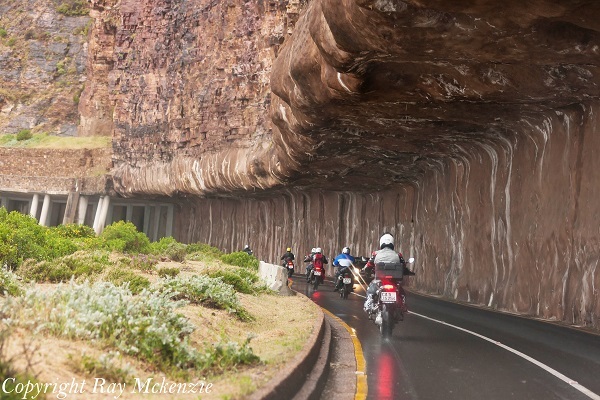 He had arrived at the airport, picked up his motorcycle, and then rode out to Cape Point with minimal gear and in record time! It was immediately clear to me that Anthony loved motorcycles and riding! His ear to ear smile as he told the story of his ride up the winding, undulating and challenging road to Cape Point told me he appreciated the handling and acceleration of a motorcycle. 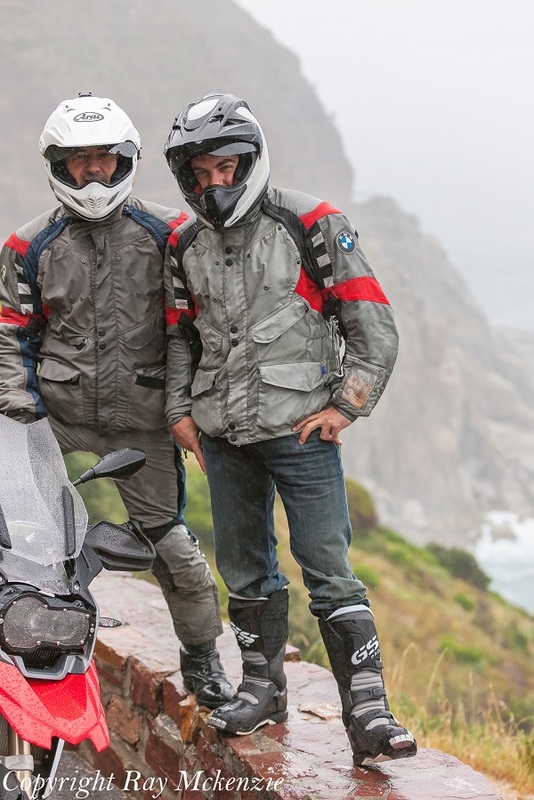 In this case he has the exact same motorcycle as Neale, a 2013 BMW R1200GS, with all the bells and whistles. We finished lunch and even though the rain was falling much harder, it did not dampen everyone spirits, all sporting huge grins as they donned their gear! 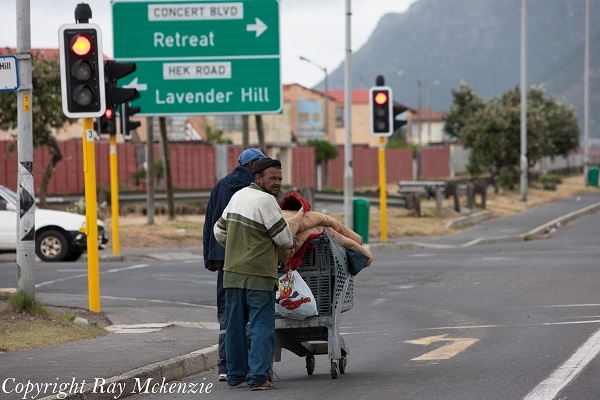 The roads down to the Cape of Good Hope sign were just as entertaining as the ones going to Cape Point, and it caused me to think about what other surprises South Africa had in store for us! 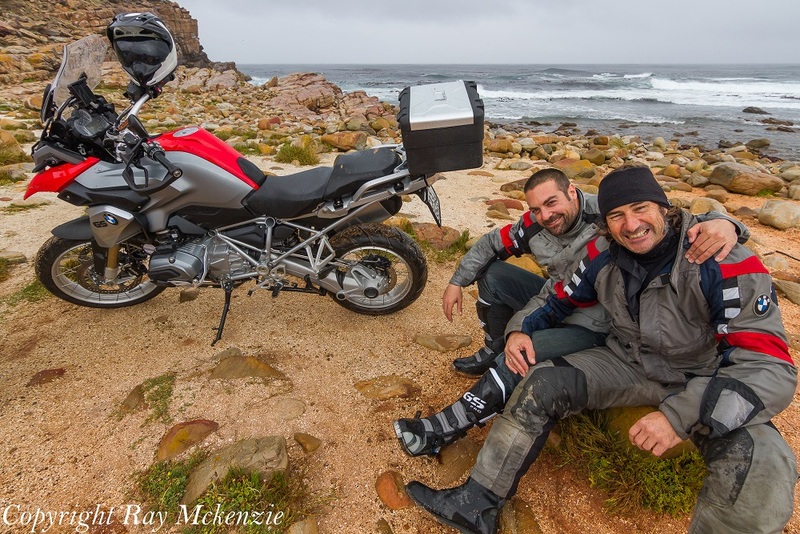 Despite heavy rain took a few group shots, the wind was howling, massive waves crashing on the rocks, and the type of rugged terrain one expects from the bottom of continental Africa! Neale, ever the ambassador entertained children who wanted to have their pictures taken while sitting on his motorcycle, mom and dad “photo bombing” every shot! 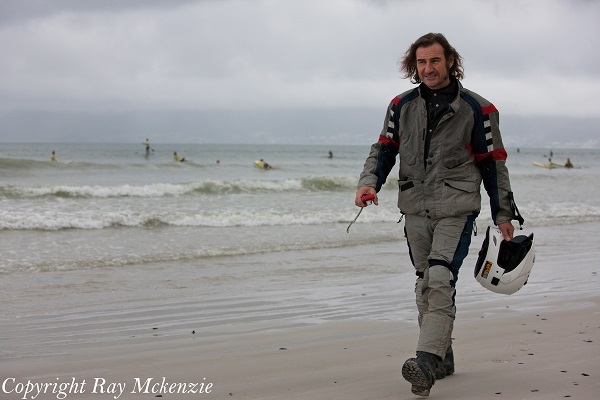 We had a long way to go, so Johann cracked the whip so to speak and we were off, heading up the western coastline towards Cape Town! We did stop on a scenic overlook hundreds of feet above the ocean, and it was amazing to see the clouds moving into the mountains not far above our heads! 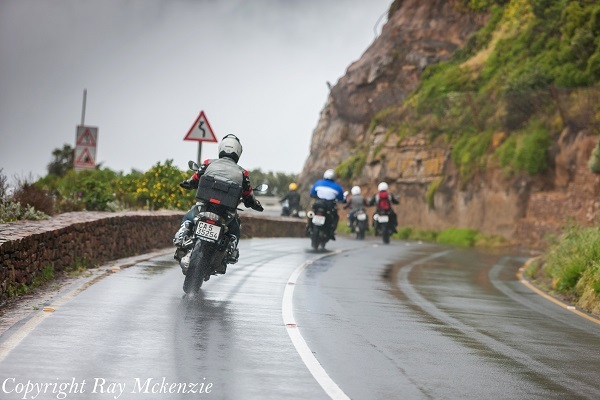 As any photographer knows, blank grey skies are very difficult to have as a background, in this case I wanted to capture the essence of the rain, the road, the cliffs, the incredibly rugged terrain, as well as some happy motorcyclists hamming it up for the for the lens while standing on a wall with a sheer drop on the other side! Yeah a wonderfully crazy bunch! Once we reached Cape Town we exchanged our support vehicle for something a little more powerful, spacious, and something I would enjoy as my office for the next two weeks, an extended cab Nissan Turbo Diesel pickup truck! What a great machine and much easier for Doctor Don to drive! 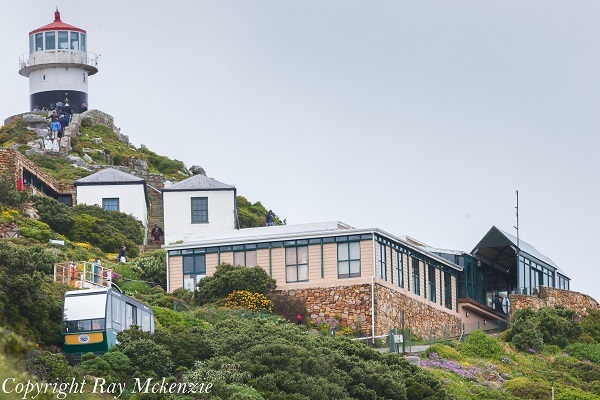 It was not long before we left Cape Town and had an uneventful ride to the Road Lodge in Belleville, and even though we were all exhausted, we had a nice group meal at the restaurant next door! The staff were happy to have a big group of hungry tourists, which made dinner all the more entertaining with stories from the ride and talk of the next destination! 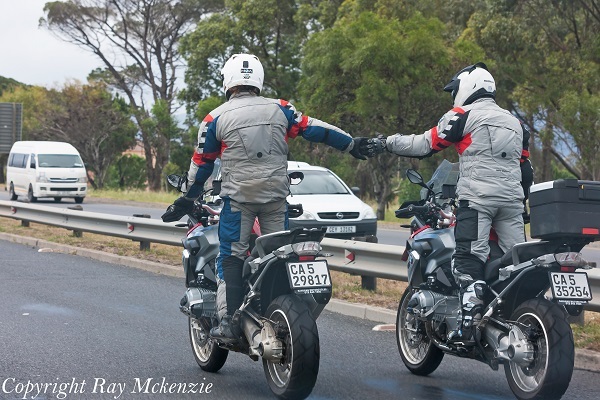 Tomorrow…the ride to the Stellenbosch Wine region!! !